Severe cases of pemphigus vulgaris (PV) are typically treated with high doses of systemic steroids. Rituximab, a chimeric (human/mouse) monoclonal antibody directed against CD20 of B lymphocytes, was recently approved by the FDA for the treatment of PV and has become an attractive alternative or adjunct to conventional steroid therapy to minimize side effects and improve patient outcomes. Though its side effect profile is much improved from steroids, rituximab therapy is not without complications. For instance, administration of biologic therapeutic antibodies, such as rituximab, produces an immunogenic response, resulting in immediate infusion reactions and, less commonly, delayed serum sickness.1,2 We report on a case of rituximab-induced serum sickness (RISS) in a patient 12 days following rituximab infusion that resolved within a few days with supportive management. A 38-year-old female with a one-year history of pemphigus vulgaris (PV) was prescribed fluocinonide (0.05% topical to affected areas BID PRN) and rituximab (two 1,000mg infusions two weeks apart) due to patient preference to avoid oral steroids. Figure 1. Erythematous and morbilliform macules and papules starting in the extremities and spreading to the trunk. 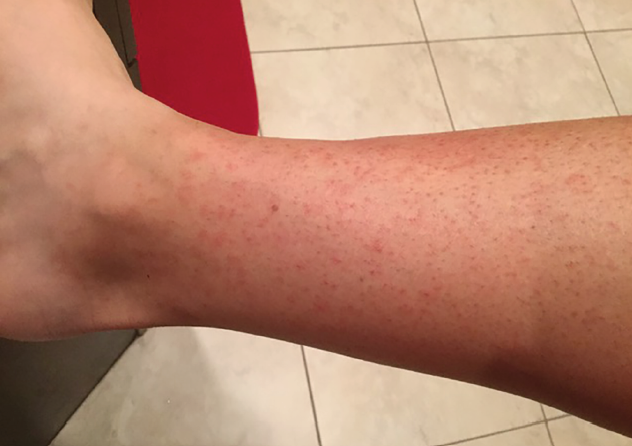 Twelve days following the first rituximab infusion, the patient noticed “bumps” on her lower legs, which coalesced as a “red rash” and spread to her upper legs, torso, back, and arms the following day. She emailed photographs to our clinic of a rash consistent with erythematous macules and papules (Figure 1). The lesion was accompanied by general malaise, chills, headache, paresthesia in the fingers and toes, abdominal pain, and diffuse joint pain. The patient took over-the-counter Benadryl and Zyrtec. Symptoms improved the next day and the rash receded within a few days. The patient presented to the clinic 10 days after symptom onset. Notable laboratory findings included elevated C-reactive protein (17.7) and desmoglein 3 antibody (156, positive>20), and platelet count within the lower limit of normal (157, N 140-400 thousand/uL). Biopsy and human anti-chimeric antibody (HACA) testing were not performed due to lesion regression. The diagnosis of RISS was made based on history and physical findings, most notably her rash, systemic symptoms, and joint pain that quickly resolved. Due to the resolution of her RISS at the time of her visit, oral steroids were not required; however, avoidance of future rituximab infusion was advised. The 2018 Match for the National Resident Matching Program (NRMP) was the largest in history with 5,881 active applicants (a 7.1 percent increase), 1,839 programs (an 11 percent increase), 5,215 positions, and 4,579 positions filled (both 7.9 percent increases). The Medical Specialties Matching Program encompasses nearly all Internal Medicine subspecialties. Since the 2015 appointment year, the number of participating programs has increased by 53.8 percent, the number of applicants by 33.9 percent, the number of positions by 44.8 percent, and the number of positions filled by 38.5 percent. The most competitive subspecialties among those that offered at least 30 positions were Allergy and Immunology, Cardiovascular Disease, Gastroenterology, Hematology and Oncology, Pulmonary/Critical Care, and Rheumatology. All filled at least 97 percent of the positions offered, and more than 50 percent of the positions were filled by graduates of US allopathic medical schools. Other less common side effects are immune-mediated. Specifically, HACA antibodies against rituximab may partially explain the high relapse rate and immunogenic side effects improved with steroids. Immediate infusion reactions, mediated by cytokine release by rituximab’s target cells, typically present with mild autonomic instability and are managed supportively. In contrast, serum sickness is a delayed type III hypersensitivity reaction observed one to two weeks after initial exposure due to the development of IgM antibodies against rituximab, resulting in widespread immune complex deposition and subsequent inflammatory response. We report a rare case of RISS in a PV patient. While rituximab has a better side effect profile than conventional steroid therapy, its immunogenic side effects and high relapse rates are prompting research into potential alternatives. Accordingly, fully-humanized monoclonal antibodies against CD20, (such as obinutuzumab, ocaratuzumab, ocrelizumab, and veltuzumab), are an active area of research and may reduce relapse rates and immunogenic side effects. Until then, dermatologists need to be aware of RISS as the use of rituximab increases for bullous diseases. No funding was provided for this paper. The authors have no conflicts of interest to disclose. 1. Tavakolpour S, Mahmoudi H, Balighi K, Abedini R, Daneshpazhooh M. Sixteen-year history of rituximab therapy for 1085 pemphigus vulgaris patients: A systematic review. Int Immunopharmacol. 2018;54:131-138. 2. Awal G, Kaur S, Kaur J, Sharma S. Rituximab-induced serum sickness in pemphigus vulgaris. Journal of the Egyptian Women’s Dermatologic Society. 2018;15(1):54-56. 3. Wang HH, Liu CW, Li YC, Huang YC. Efficacy of rituximab for pemphigus: a systematic review and meta-analysis of different regimens. Acta Derm Venereol. 2015;95(8):928-932. 4. Joly P, Maho-Vaillant M, Prost-Squarcioni C, et al. First-line rituximab combined with short-term prednisone versus prednisone alone for the treatment of pemphigus (Ritux 3): a prospective, multicentre, parallel-group, open-label randomised trial. Lancet. 2017;389(10083):2031-2040. 5. Karmacharya P, Poudel DR, Pathak R, et al. Rituximab-induced serum sickness: A systematic review. Semin Arthritis Rheum. 2015;45(3):334-340. 6. Lawley TJ, Bielory L, Gascon P, Yancey KB, Young NS, Frank MM. A prospective clinical and immunologic analysis of patients with serum sickness. N Engl J Med. 1984;311(22):1407-1413. Have an interesting case to share? 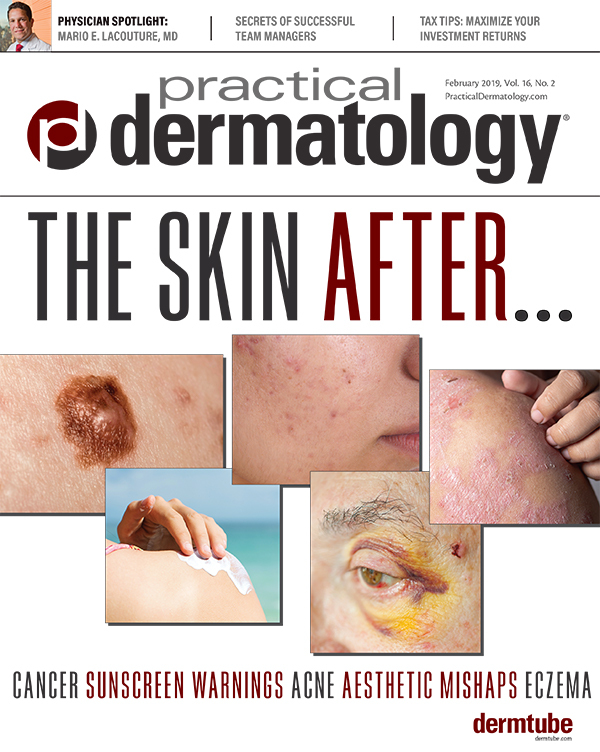 Practical Dermatology® is seeking submissions for the 2018 Resident Resource Center. A panel of physician editors will select a best paper for the year. The winner will be recognized in Practical Dermatology® magazine and DermWire.com and receive a reward of a $200 American Express gift card. Angela Weatherall, MD is a dermatologist in Boca Raton, Florida.